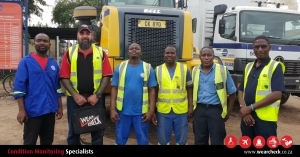 WearCheck technical support consultant Quentin Gustav von Kleist recently travelled to Nchalo in Southern Malawi, where he conducted training courses for Unitrans. Staff from the cartage and transport contracting company were taught all about oil analysis, including the importance of taking samples correctly, how to complete the sample paperwork, how to interpret report results and what remedial action to take where necessary. WearCheck technical support consultant Quentin Gustav von Kleist (second from left) with some of the Unitrans workers who underwent condition monitoring training last week.